Anthony T. Padovano holds doctorates and professorships in theology and literature. He is the author of twenty-nine books including three award-winning plays, translated into nine languages. He has been visiting professor at twenty-five American colleges and universities, lectures world-wide and appears regularly in the media on both sides of the Atlantic. The views expressed in this letter are his own. Your personal journey in life, with all the passion and grace you bring to it, matters immensely, not only to you but to me and to many others. I will not encourage you to give your heart to the Church if it is one you cannot trust or will harm you or not listen to you. As I read the Gospel, I learn there that the Spirit of God listened carefully to a woman in what may have been the two most crucial and defining moments in the birth of the Church. Let me tell you about them. The first of these women was Mary of Nazareth. She was alone when it was revealed to her that she would become the mother of the Messiah, if she agreed. Her “yes” created the Incarnation in her body. Without a woman, God would not be human. In God’s eyes, so to speak, a woman was entrusted freely to say “yes” to the overwhelming gift of God living at our side as one of us. I am unwilling to invite you to become part of a Church that does not honor and trust women or that assigns them a secondary role in its life. The second of these women was Mary Magdalen. Again, she is alone, in a garden, by an empty tomb. She weeps for the horror Jesus of Nazareth suffered on the cross and for the missing body. She hears a gentle voice say her name, “Mary”. She knows the voice so well. It is Easter for the first time in her soul as she turns to say whole-heartedly, “O Rabboni. O Rabbi”. Mary Magdalene is the first human being to whom Easter is granted. 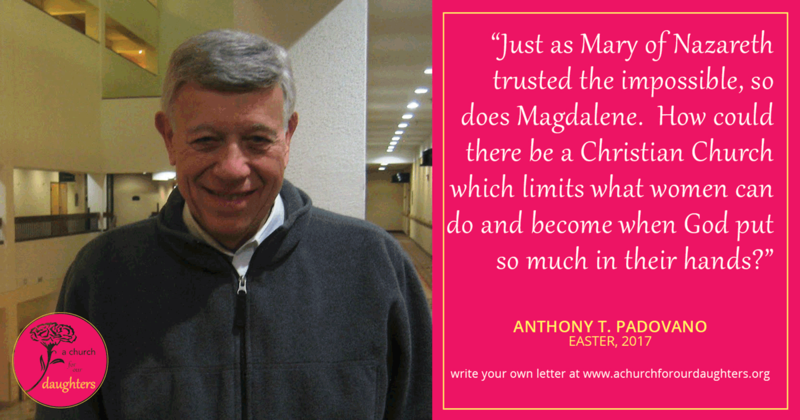 Just as Mary of Nazareth trusted the impossible, so does Magdalene. How could there be a Christian Church which limits what women can do and become when God put so much in their hands? Magdalene wept when she pondered what had happened to the body and blood, the heart and spirit, the glory and radiance of someone she loved. She showed us that Easter is not a miracle unless love is a miracle. Easter does not happen in the body of Jesus but in the one who, sensing his life and can proclaim and sigh, “O Rabboni! O Rabbi.” Love is the season that gives us Easter. It is Magdalene who leads us to what will become the Church’s central celebration. Every man who ever loved a woman finds poetry in her nearness and seeks a life that is more than prose at her side, with the two of them equal partners. Twice in the Gospel, a woman alone, is charged with an act of faith that gives us God in a way no one of us would have thought of God. Mary accepted, in a word, the fact that death does not end a human life… Like love, it merely changes the form of life. The Gospel tells us that, without a woman the Son of God would not have been born as a human child and, without a woman’s act of faith, the first Easter appearance would have been met with denial. My dearest daughter, if you became a part of the Church I ask you to enter it as a woman who knows that no man can have a role in such a Church that a woman cannot perform at least as well.